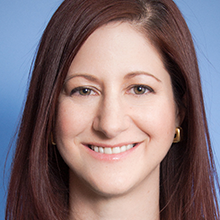 As Group Lead, Eva Press leads Facebook’s sales and account teams in the US for the Consumer Packaged Goods, Retail, Healthcare and Politics verticals. In this role, she and her teams focus on partnering with large, complex, traditional advertisers to navigate the disruptions that are shaping the marketing landscape. Eva joined Facebook over six years ago and has held strategic roles on the Creative Shop and Global Accounts teams, helping advertisers and their agencies grow their businesses by understanding marketing in a mobile-first world. Before joining Facebook, Eva spent ten years in Brand Management at Kraft Foods, leading such iconic brands as Planters Nuts and Oreo Cookies. She holds her MBA from the Kellogg Graduate School of Management, and undergraduate degrees from the University of Pennsylvania and the Wharton School of Business.